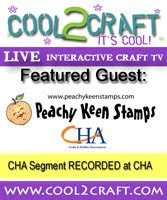 Hello and welcome to the second night of sneak peeks of the Peachy Keen Stamps August Release! We're having a SPOOKTACULAR time creating and sharing with these new stamps that are due to be released tomorrow evening! Join us at 6 p.m. tomorrow on The Peachy Keen Stamps Blog for our celebratory blog hop, where you'll find the entire new release and some out of this world samples from our Design Team. Here's my card for you tonight. The paper is from my scrap tub, and a little strategically placed ribbon finished off this card. Pretty easy peasy and a whole lot of fun!! Be sure to stop by the PKS Blog to see what the rest of my DT sisters have created, and don't forget to leave your comments here, AND on the rest of the blogs for a chance to win all the stamp sets we're showcasing tonight!!! Thanks for stopping by and HAPPY STAMPIN'!!!!! He's a really scary dude. Wouldn't want to meet him in the dark. thanks for sharing a fun project. Thanks for including the Copic numbers you chose for the skeleton. You did a great job. I can't not even tell you how much I adore this card!! It is fabulous!! Your coloring is top notch, and the glitter adds so much!! LOVE LOVE LOVE this Lorie!!! This is just super wonderful. I love all the super details in this. That is the most "refined" Skelton I''ve ever seen. This is absolutely stunning!! Your coloring is perfection!! such a cute poseable skelton! Your colouring is so perfect. I love this new poseable skeleton. Super sneak peek. Your Skeleton Card Is Too Cute!! I LOVE this skeleton!! She's too cute! Love the way you coloured her and I LOVE the card design! This skeleton looks like a lot of fun to play with :) love the pose! As always Lori your card is perfect! LOVE!!! LOVE your sassy skeleton. Lov the paper, ribbon and great colors. Love your waving skeleton with the cute (hair) bow :D Just too cute. This poseable skeleton is just great. Your coloring is fantastic. Love the little bow, so I guess that is a girl skeleton! Great release- can't wait to receive it! OMG,this is great! I can see the glitter for sure! Now that's a cute skeleton. It's almost as if he's standing there taunting you with the wave of his hand and he gives you that childish smile. LOVE it! Ok, I'm thinking these skeletons are my FAVE!!! Love them!! Great job Lorie! Can't wait to get my hands on this release!!!! What a fun card. I just love that the skeleton is posable. Oh I just love this one. Love how you added the bow to her hair and the face you chose to use on her. Your coloring is so cool. Thanks so much for sharing. what an adorable, creepy skeleton....love it! eeek. I love the bow... awesome creation. Just loving the hop. It's so fun to see the different takes all of the stamps.. I love that you gave the skeletons some 'life' with the colors!! Even a skeleton should feel beautiful!! I'm so glad I figured out how to blog-hop!! Great job on the coloring. Love that you put the bow on the head! Oh my ... she's truly not as wicked as she looks. That bow is a "dead give-away." 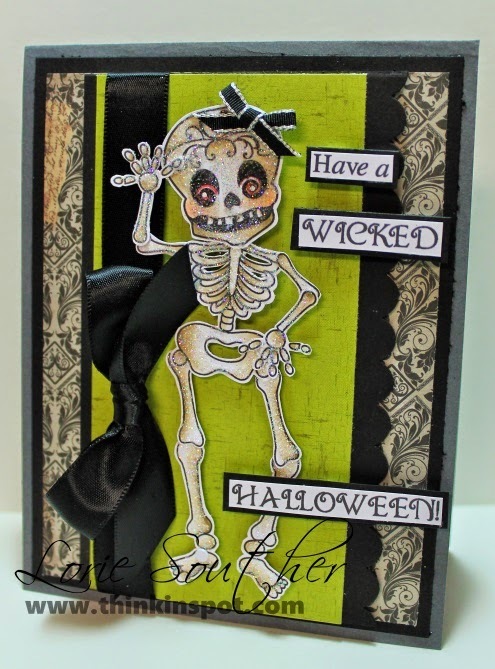 :-) Nice job, Lorie, on creating something creepy!